Based on the sound of the name renewable, a person might think that using only “renewable” energy is ideal–something we should all strive to use exclusively. But there are lots of energy sources that might be called “renewable,” and lots applications for renewable energy. Clearly not all are equally good. Perhaps we should examine the “Renewables are our savior,” belief a little more closely. Figure 1. 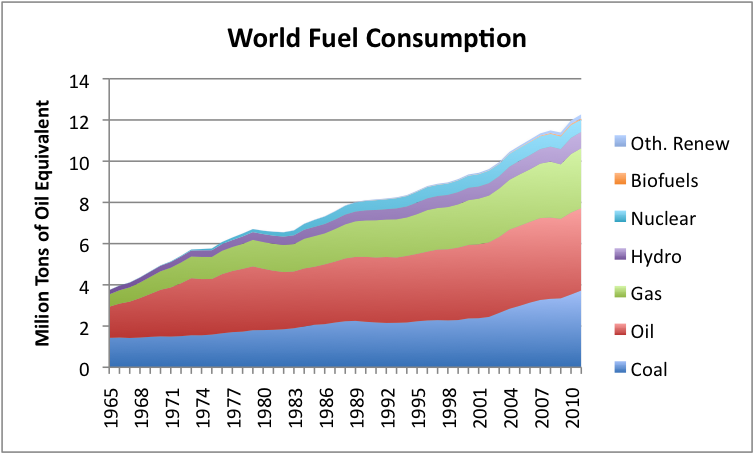 World fuel consumption based on BP’s 2012 Statistical Review of World Energy data. 1. Renewables that we have today won’t replace the quantity of today’s fossil fuels, in any reasonable timeframe. Figure 1, above shows the distribution of fuels used since 1965. Biofuels, which would include ethanol and other types of biofuels, such as palm oil, amounts to 0.5% of world energy supply. Its orange line is not very visible on the chart either. Hydroelectric, shown in purple, has been around a long time–since 1880 in the United States. It amounts to 6.4% of world energy supply. Its quantity is not growing very much, because most of the good locations have already been dammed. In total, the three categories amount to 8.5% of world energy supply. If growth continues at today’s rate, it will be a very long time before renewable energy supply can be expected to amount to more than 10% or 15% of world energy supply. We very clearly cannot operate all the equipment we have today on this quantity of energy. In fact, it is doubtful that we can even cover the basics (food, water, and heat to keep from freezing) for 7 billion people, with this quantity of energy. 2. If there is a huge collapse scenario, there is a possibility that those who are in possession of renewable energy technologies will be able to use these technologies to their own benefit, when others do not have such options. There are many ways that today’s technologies may benefit a few hundred thousand or a few million people who happen to have use of them, for perhaps a few decades. A person who has a solar panel and backup battery may be able to operate an electric light, when no one else has one. A person living near a large hydroelectric plant may expect to have electricity, when other parts of the country do not. A person with a solar thermal hot water heater may be able to have hot water, when others do not. There are of course limits to this. If the solar panel depends on battery backup, the battery may wear out pretty quickly. We know from the Second Law of Thermodynamics that everything degrades over time. This includes solar panels, hydroelectric plants, transmission wires, and even the solar thermal hot water heater. So at most, the benefit of today’s technology is only likely to last for a few generations, unless we are able to repeat making new units. There is considerable misunderstanding regarding the availability of electricity from solar PV panels on roofs of houses. 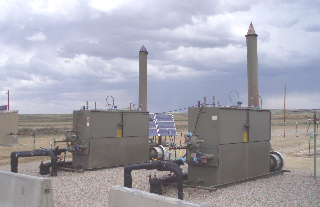 Usually, these are operated with an inverter (to produce alternating current) and connected to the electric grid. These units cannot be used if there is an electrical outage in the area. With some rewiring, the panels might be used on a stand-alone basis. On such a basis, their use would be much more limited. They could only be used for devices taking direct current, and only when the sun is shining (unless backup batteries are available). 3. Renewables can’t be expected to operate on a “stand-alone” basis, in any reasonable timeframe. Each energy source is quite specialized. In the past, human and animal labor played an important role in growing crops. Charcoal made from wood was used in making a very limited amount of metals and glass. It was possible to use traditional sources of “renewable energy” to power society, in large part because only a small amount of non-human and non-animal energy was used in total. World population was 1 billion or less, not 7 billion. The standard of living was quite low. In India today, the crops are grown primarily with human and animal labor, two sources which could be considered “renewable”. Figure 2. 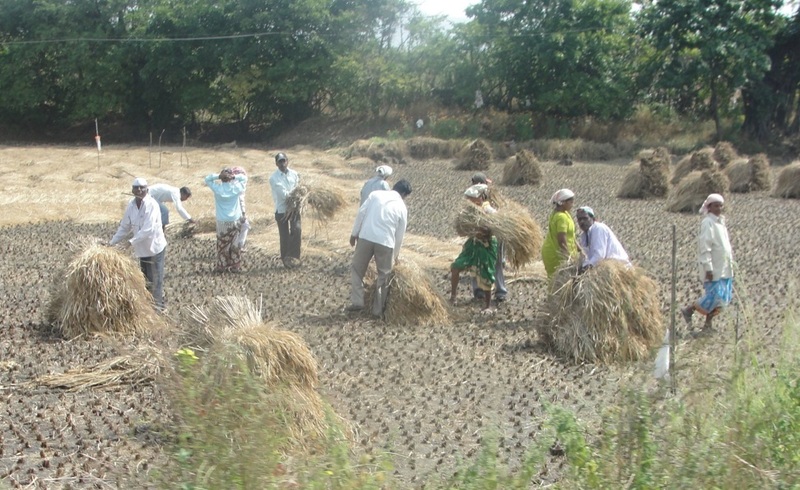 Workers harvesting rice in India. Photo taken by author while visiting India in October 2012. Even with this low standard of living, there is a substantial fossil fuel contribution that would be difficult to eliminate. The hand tools that workers use are sickles, which are made using coal. India uses nitrogen fertilizer made using fossil fuel (natural gas or coal) as well as irrigation pumps (manufactured using fossil fuel, and fueled by diesel or electricity). Only the electricity component would be fairly easy to eliminate with today’s renewable energy (if scaled up sufficiently). Some seem to believe that renewables can power the world on a stand-alone basis. The tiny quantity of renewable energy currently available is, in and of itself, a huge limitation in making this happen. Furthermore, today’s solar PV panels and wind turbines are made and transported using fossil fuels, and most of our transportation industry uses petroleum. In theory, we could develop new devices that use only electricity, or create enough biofuels to make a complete closed loop (devices made and transported only with renewables). In practice, we have trillions of dollars of cars, trucks, airplanes, and construction machinery built to use oil. Because of this, a complete changeover to renewables is at best decades away. At this point, renewables are only “fossil fuel extenders.” They operate within our current fossil fuel system. They cannot be expected to reproduce themselves without the benefit of fossil fuels. 4. Some renewables are economic in today’s world, while others require subsidies. There are clearly many types of renewable energy that are economic in today’s world. Geothermal is economic in some locations, because there is underground heat that can be used to boil water to create electricity, or to heat homes directly. Solar PV panels, together with back-up batteries, are often the lowest-cost electricity source in remote locations (Figure 3, below). This is why energy companies use them to provide power in remote locations. Solar thermal energy is inexpensive for heating swimming pools and for heating hot water in warmer climates. Other renewables require subsidies. We usually think of intermittent renewables, such as wind and solar PV panels, as requiring subsidies. In fact, it is often difficult to tell how much subsidy is truly required. Part of the subsidy comes in the need for upgraded grid transmission; part of the subsidy comes from the need to run fossil fuel back-up stations fewer hours and ramp them up and down more often, making them wear out more quickly; part of the subsidy comes in the form of increased complexity, that makes it more difficult to maintain electricity supply for the long run. There is no obvious reason to believe that intermittent electricity will make the electric grid last longer–if we are increasing the complexity of grid regulation at the same time we are reaching limits of many types, adding more intermittent renewables would seem to increase the likelihood of early failure. As long as there are renewable energy mandates for renewables, and costs divided among many different payers (most of whom are not reimbursed for their payments), it is hard to tell how much today’s subsidy actually is. Energy return on energy invested (EROEI) calculations of intermittent renewables do not look at the whole system cost, including impacts on other players, so overstate economic benefits and understate energy costs. In the end, we do not have a good measure of how much mandated renewable energy supplies cost us. Also, as we add more intermittent renewables to the electric grid, the cost to other players can be expected to escalate, making the understatement of costs (and overstatement of EROEI) greater over time. 5. High-priced renewables help some of our problems, but make others worse. Inexpensive renewables–ones that require no subsidy or mandate–are not a problem from a financial point of view. Many of these can help the environment without providing economic challenges. The ones that tend to be problematic are ones that require subsidies, especially when we have no idea how much the subsidy really is. Figure 4, below, gives my view of how some of the various limits we are reaching act together. Figure 4. Author’s view of how various limits might work together to produce different symptoms. In my view, the limits we hit first are the limits on the outside of the chart on Figure 4: financial issues and political issues. (I introduce this chart in my post Our Energy Predicament in Charts.) 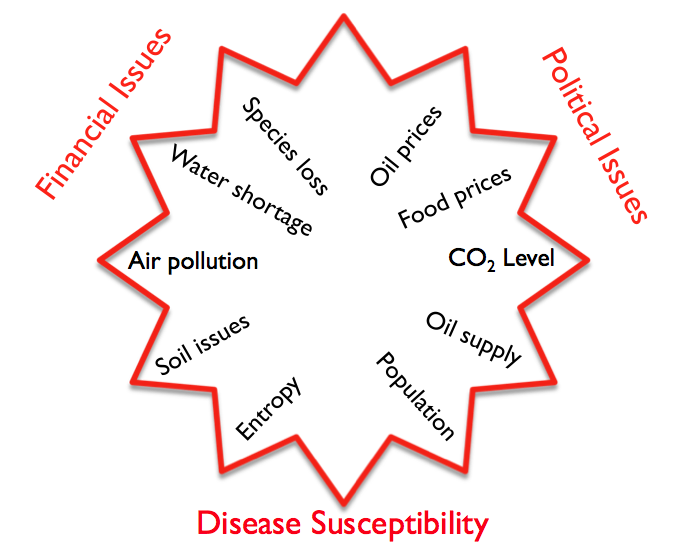 Disease susceptibility enters in, as there are more unemployed and as the government finds it necessary to cut back in financial programs for the poor and unemployed. If the price of renewable energy is high, it tends to exacerbate the problems on the outside of this chart, even as it reduces CO2 contributions within the country, and reduces local pollution as electricity is made. There may still be pollution issues associated with making the rare earth metals that go into the wind turbines or the solar panels, but these are conveniently in China or another remote location. Making devices themselves also requires fossil fuels–usually coal if the devices are imported from China. Figure 5. 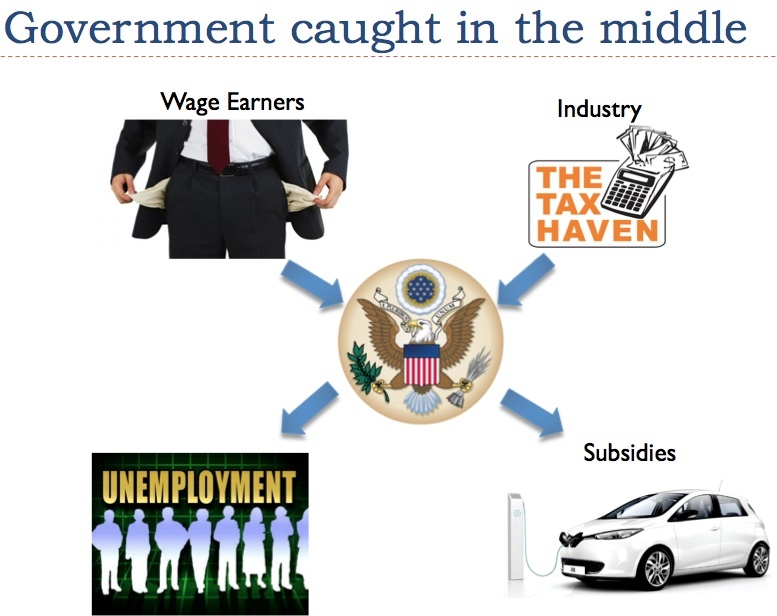 Author’s representation of how government financially caught in the middle. Photo credits: Texaspolicy.com, Thetaxhaven.com.au, Usahitman.com, politic365.com, autoevolution.com. The government pays out more in funds for subsidies. In the end, when we look at world CO2 emissions, we discover that they have in fact risen relative what would have been expected prior to the Kyoto protocol (signed in 1997), rather than fallen, as the emphasis on renewables grew (Figure 6). Figure 6. 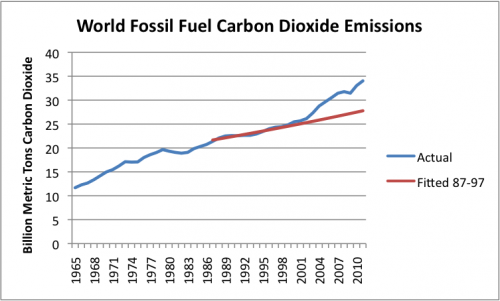 Actual world carbon dioxide emissions from fossil fuels, as shown in BP’s 2012 Statistical Review of World Energy. Fitted line is expected trend in emissions, based on actual trend in emissions from 1987-1997, equal to about 1.0% per year. A major reason for emissions growth shown in Figure 6 seems to be globalization. I wonder, though, if globalization was pushed forward by the practice of looking at emissions within a country’s own boundaries, while excluding emissions associated with imported manufactured goods. The pushed developed countries toward renewables, at the same time Asia increased market share greatly through its use of coal. Germany is now the leader in the use of renewable energy. Recent reports say that there are 800,000 German households that cannot pay their electricity bills, because of the high cost renewables add. There are also reports that German natural gas producers want to close back-up plants for wind/solar, unless they too receive subsidies. 6. Even if renewables look to be cheap and non-intermittent, there still can be problems with their use. Unfortunately, nature doesn’t really provide us with a free lunch. If we use growing plants–such as trees, corn, palm oil trees, or other biomass, we start reaching limits as well. It is very easy to cut down trees more quickly than they regrow. We know from research by Sing Chew that deforestation was already a problem 6,000 years ago, when there were only 20 million humans on earth. Deforestation also leads to soil loss and erosion, which is also a huge problem. Plowing of fields for crops of any kind in fact tends to lead to soil loss. Hydroelectric, as good an energy source as it is, has its downsides as well. In the early years after its construction, it tends to increase CO2 production in the flooded areas. It tends to interfere with fish migration, and with the normal balance of species. Building large hydroelectric plants can take huge amounts of arable land out of cultivation and displace large populations. It can lead to earthquakes and landslides. One country can sometimes “steal” the water of another, by building a hydroelectric facility. Our whole ecological system, including animals and our climate system, requires a balance among the various species. We are being warned by scientist today that humans cannot simply commandeer all of the natural resources for our own use. Renewables often use natural resources that other species also have a need for-especially biofuels, wood and biomass. Biologists tell us we are in danger of reaching a tipping point due to overly high use of “net primary productivity” (Barnosky and Haberi). It truly would be convenient if nature had provided us with a free lunch, in the form of renewables. At best, we were given something that if we use wisely, can add a little to what we have today. Renewables may, in fact, “save” some remnant of humanity, if limits truly become a problem in the near future. 1. It would reduce the pollution impacts of making the renewable generating devices. 2. It would reduce the cost of making alternative energy. 3. It would improve the scalability of such renewables. 4. It would improve the EROEI of such renewables. There seems to be widespread belief that an EROEI of 3 or 4 or 5 is “good enough” for renewables. The economy is showing signs that our current cost of fuels is already way too high. What we really need to do is bring our energy cost level down. Thus, what we really need is renewable energy sources that will reduce our average energy cost and raise our average EROEI of fuels. This entry was posted in Alternatives to Oil, Introductory Post and tagged biofuels, energy, fossil fuels, Hydroelectric, renewable energy, wind, wind energy, wind turbines. Bookmark the permalink. If Orlov’s ideas were to take hold here (this blog) then posters would be including in their discussions of gardening, for example, their plans to grow a surplus portion of their crop for barter-trade transaction with friends, family, and other (most valued) people. I for instance have been making yogurt and hard cheese and passing out these products for free as sample during my encounters with strangers and acquaintance during local business trips. I am always in the process of picking up information and leads on resources from others that might have goods or services I need for advancing my particular business. But to begin to accomplish the above one has to develop some skill, product, or service that could be desired by others. Lifting up (re-valuing) mankind is the solution to our energy crisis (and other related problems). Peak oil is dead? The only thing that I see dead in that propaganda piece that you reference is the brain cells of anyone who believes such drivel. The industry trolls have been telling us for years that there is plenty of oil. In the face of evidence to the contrary one might ask why. It boils down to “share price”…If investors knew what a crock it was the share price of oil companies would tank. The inflated prices are based on the assumption that they will be able to economically bring their ‘stated reserves’ to the market. It’s a pipe dream Chris. And even if it were true, a martini would only be justified if there were no problem in continuing to pump CO2 into the atmosphere. Better stick with beer…right after a cold shower. I suppose I should be writing another article on why this thinking is wrong. You appear not to have read the comments appended to the article you link us to, otherwise I am sure you would not have wasted our time with it. Mel, I read the article cited and several others the resulted from a google query, all claiming similar enlightenment. Not just one but several highly respected members of the financial community. men whose daily income may well far exceed that of us mere wage slaves. If you object to being so enlightened, then you are welcome to deal with it. I’m sorry I’m late to this discussion as it has been enlightening. I’m not sure if I entirely support Gail’s view that green energy would be unable to fill the gap as there another studies that are more optimistic. There is still a few gigatonnes of CO2 we could burn and enough oil to make a transition over the next 35 years. Over that period most of what we have today will be replaced anyway. I do agree transport offers the greatest obstacle and as a small farmer the value of liquid fuel is immense. The work my tractor does even if fuel were £20 a gallon out performs human labour so perhaps the last of the oil could be traded for CO2 sequestration in bio-char for soil enrichment. Most productivity and even some smelting can be done with electricity so at some point, tide, wave, wind, solar and some nuclear would power the economy, with the last of the oil, or expensive air to fuel tech running the mining, agricultural, shipping and aviation industries. And all of it will be more expensive so the biggest loss will be the middle-classes. Oil has supported a plethora of hairdressers, gym trainers, service sector and service professionals [although I think the service professionals who warned of the limits to growth should keep their jobs and those who dismissed it should be sacked!]. As you have pointed out- developing countries have a bigger population of manual low skill workers and they also have few unemployed at least few who are paid not to work. I side with the whimper rather than the crash bang crisis. Things will just get more expensive, jobs will get crappyer, you will have more friends who won’t go on holiday or lose their jobs, your children will earn less than we did and the best pensions were had by our parents.